About Us – T.E. 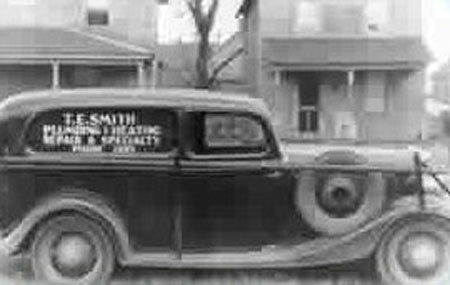 Smith & Son, Inc.
T.E. Smith is a third generation, family-run mechanical contractor providing quality plumbing, heating, air conditioning, and customized systems to the Delmarva Peninsula. For over 75 years, our specialized expertise in commercial, industrial mechanical systems has been employed by hundreds of loyal customers with applications ranging from plumbing systems to computer-controlled H.V.A.C. systems. We serve and employ the people of the Delmarva Peninsula. In addition to our field services, we offer a full range of service agreements such as full equipment analysis, preventative maintenance and full parts and labor agreements with twenty-four hour emergency service available. We offer full system designs with custom piping, duct work fabrication and control systems with the use of all applicable materials for each job. T.E. Smith and Son is located in Salisbury, Maryland, the hub of the Delmarva Peninsula, and services an area within a seventy-five mile radius. Our staff consists of top grade mechanics in their prospective fields and our average employee has been with our firm for more than ten years. Our thirty plus vehicles are electronically dispatched and available at all times. We are confident that any references requested will verify our long standing reputation, responsiveness, and our willingness to stand behind our work. T.E. Smith and Son is fully licensed in Maryland, Virginia and Delaware in plumbing, HVAC and electrical and is fully insured and bonded in all counties and municipal jurisdictions. T.E. Smith and Son is ready to serve you. Melissa Quail - Admin. Asst. Home Services Projects Employment Contact Us //// All Rights Reserved © 2015 | T.E. Smith & Son, Inc.